Contemporary cities are spaces and places traversed by a diversity of movements, making them very special locus for analysing society. The ESA’s Research Network 37 – Urban Sociology- coordination team is working to stimulate scientific debate within the area of urban sociology. In times of digital information, conferences are very important spaces to debate current issues, showcase emerging research and discuss new approaches. 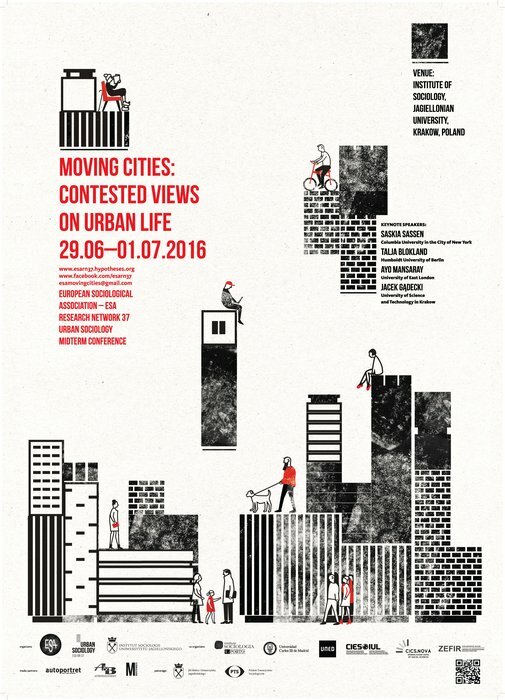 The ESA Research Network 37 – Urban Sociology – Midterm Conference will take place at the Jagiellonian University, Krakow, Poland, June, 29th- July, 1st, 2016. Our will is to create a cross-disciplinary space of scientific debate open to sociologists and other scientists from other disciplines interested in analysing and understanding urban life in moving cities around the globe. We welcome papers from young and senior academics developing research on cities and urban life, expecting that everyone can take useful insights to their works from their participation in this conference. We hope that this meeting can be a starting point for joint research and networking.